Size: This largest of all hard-shelled sea turtles has a carapace length of 80 140 cm and weighs 68 190 kg, exceptionally up to 315 kg or even more. The tiny hatchlings are only around 5 cm long. Green Sea Turtles move across different habitat types during their lifetime. Hatchlings emerge on beaches, then swim to offshore areas, where the juveniles are believed to spend up to five years in the open ocean. As adults they live in shallow bays and protected nearshore areas over seagrass beds, salt marshes and coral reefs. The young are carnivorous, feeding on fish eggs, sponges, jellyfish and mollusks; as they mature, they shift to an almost exclusively vegetarian diet of seagrasses and algae, which makes them the only herbivorous adult sea turtles. Though they spend almost all of their life submerged, the turtles must regularly surface to breathe air. Routinely, they dive for about 4 5 minutes and come up to exhale and inhale within 1 3 seconds. With much reduced activity, they can rest or sleep underwater for several hours. Adult females migrate vast distances between feeding grounds and nesting beaches every 2 5 years, habitually returning to the same beach, mostly their own birthplace, while males visit the breeding sites each year, attempting to mate. Females crawl out on beaches, dig nests and lay eggs at nighttime. Later, hatchlings emerge and scramble into the water. The less than 1 % that reach maturity may live to 80 years. Chelonia mydas is widely distributed in tropical and subtropical waters throughout the Pacific, Atlantic and Indian Oceans, as well as in smaller sea areas such as the Arabian Gulf, especially near continental coasts and around islands. Many islands worldwide are known as “Turtle Island” due to Green Sea Turtles nesting on their beaches. The IUCN Red List of Threatened Species classifies the Green Sea Turtle as Endangered (EN) in its global assessment. 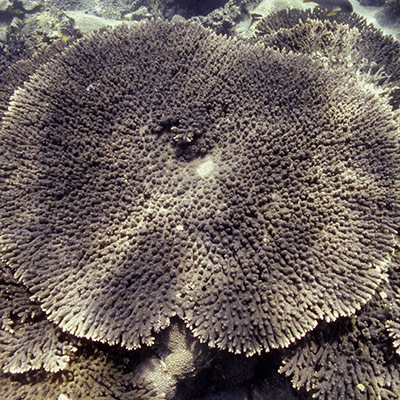 The species is protected in most countries, international trade is prohibited through CITES regulations. Although impacts have been reduced, the turtles are still affected by incidental threats, including fisheries bycatch, habitat degradation, and disease. The typical hard shell that encases the turtle’s body comprises two parts that are joined at the sides: the convex carapace above and the nearly flat plastron on the underside. Both consist of a layer of bones, covered with a layer of keratin plates, the scutes, which are arranged in distinctive patterns. 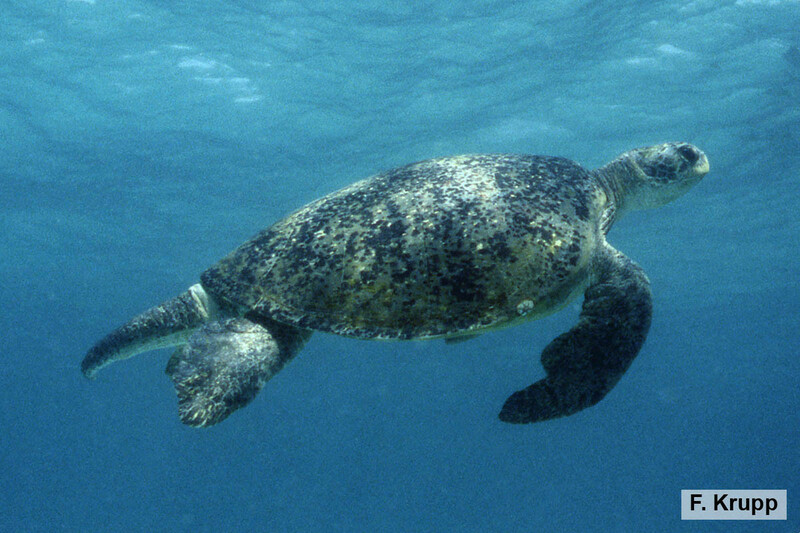 Green Sea Turtles have a smooth carapace with an oval outline, tapering towards the rear, with four pairs of scutes at the margin flanking five central scutes. The plastron is notched at four points where the paddle-shaped fore and hind limbs, or flippers, emerge from the shell. The head is relatively small and blunt; it cannot be retracted into the shell as in land turtles. It has a strong beak that is short and rounded, bears no teeth, but has a coarsely serrated cutting rim in the lower jaw and opposing strong ridges inside the upper jaw. The species can be distinguished by having a single pair of scutes between the eyes and a single frontal claw on each flipper. Green Turtles do not actually have green shells (the name refers to the greenish color of its fat), but instead the carapace has color patterns that vary with age and between populations, from pale to dark olive-brown or black, spotted or marbled with variegated blotches, whereas the plastron is generally pale yellow or whitish, the head and limbs are dark-colored and each scale of the reptile skin fringed with yellow.